When it comes to talking about modern France, French films, TV programmes, radio broadcasts, conversations, books and magazines are full of names, expressions and terminology that is familiar to any educated Frenchman or woman, but may be meaningless to the reader, viewer or listener who has never lived nor been brought up in France or a French cultural environment. From the Académie Française to Zinédine Zidane, they include a vast array of names and words. The About-France.com Dictionary of Modern France is an encyclopaedic dictionary, a glossary bringing together and explaining the most important words and names that the reader, viewer or listener is liable to come across. It includes prominent people in modern France (though not necessarily the most talked about or photographed), its institutions, organisations, the defining moments of modern French history, the key places in modern France, the cultural icons and emblems, and other words and phrases that belong to life in modern France, but can leave the foreigner totally perplexed. You will find in this dictionary a range of terminology, including perplexing words of phrases from French life, notably French officialdom. You can learn what an arrêté is, or what a Préfet is; but if it's a dictionary of the French language that you're looking for, or a French-English dictionary, the Dictionary of France will only be of very limited assistance. Do you need this dictionary? 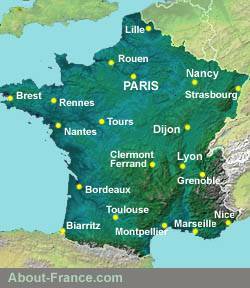 Here is just a selection of twenty topics covered in the About-France.com Dictionary of France. What does each word or phrase signify? How many of them you can define, without looking at the dictionary? ASSEDIC, Bison futé, Commune, Delanoé, Evian Agreement, France Bleu, Grand Cru, Hexagone, Journal Officiel, Leclerc, Marianne, Matignon, Mutuelles, Numéro Vert, Obélix, PACS, Préfet, RMI, Saumur, SMIC.